Catalytic processes are relied upon globally for trillions of dollars per year of industry. The conversion of oil to gasoline, transformation of natural gas and nitrogen into fertilizer, and conversion of un-burnt fuels into less harmful gasses in the tail pipes of cars all rely on solid state catalysts. Increasing demands for efficient, environmentally friendly chemical processes, in concert with the push to utilize emerging natural resources, rely on the development novel catalytic materials and processes for success. We use principles from chemical engineering, materials science, physical chemistry and solid-state physics to engineer catalytic reactions towards these goals. We develop molecular level insights into governing phenomena of catalytic reactions by coupling quantum chemical calculations with an array of experimental and characterization techniques. Mechanistic insights are utilized to guide the synthesis of catalysts with targeted geometries, compositions and architectures. Congratulations to our Post Docs Bhogesh and Kun who each had their papers accepted today! Look for Support induced control of surface composition in Cu-Ni/TiO2 catalysts enables high performance conversion of HMF and furfural to methylated furans in ACS Catalysis and Balancing near-field enhancement, absorption, and scattering for effective antenna-reactor plasmonic photocatalysis in Nano Letters. Congratulations to Yibo Jiang for the successful thesis defense and accompanying Masters Degree. Everyone in the lab wishes you all the best. 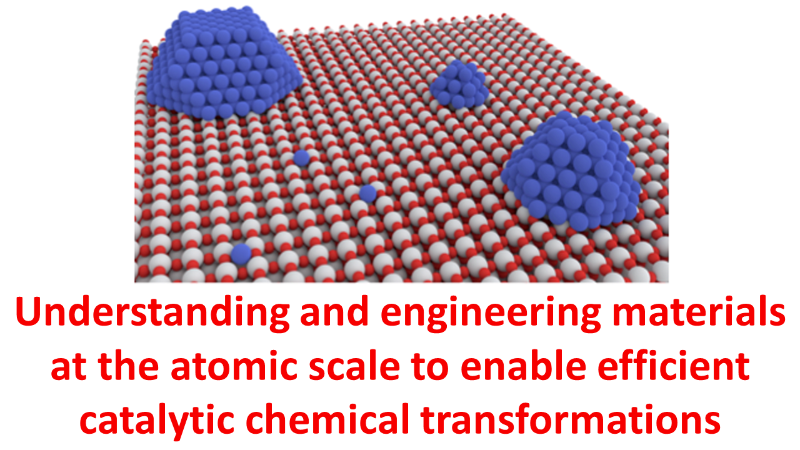 Congratulations to Dr. Avanesian and Dr. Kale for their recently accepted paper in JACS titled "Quantitative and Atomic Scale view of CO-Induced Pt Nanoparticle Surface Reconstruction at Saturation Coverage via DFT Calculations Coupled with in-situ TEM and IR". Check it out here. Congratulations to Dr. Kale on his new position as a post-doc in Dr. Mark Davis' group at CalTech. We wish you all the best. A big welcome to Ji Qi and Amy Aube as the newest members to join the Christopher Research Lab. Congratulations to Dr. Talin Avanesian for the successful defense of her PhD Dissertation! Congratulations to Dr. Kale and Dillon Gidscumb on their paper titled "Evaluation of Platinum Catalysts for Naval Submarine Pollution Control" accepted for publication in Applied Catalysis B.
Congratulations to the Christopher group, alumnus John Matsubu, and current grad student Leo DeRita on their work published in Nature Chemistry titled Adsorbate-mediated strong metal-support interactions in oxide-supported Rh catalysts. Check out the UCR highlight here. Congratulations to Matt Kale on his recently accepted paper in ACS Catalysis titled "Utilizing quantitative in-situ FTIR spectroscopy to identify well-coordinated Pt atoms as the active site for CO oxidation on Al2O3 supported Pt catalysts"
Congratulations to Talin for her recently accepted paper in ACS Catalysis Letters titled "Scaled degree of rate control: Identifying elementary steps that control differences in performance of transition metal catalysts"
Congratulations to Matt Kale on the successful defense of his thesis and the second member of the Christopher Lab to earn his PhD. A Special Congratulations to John Matsubu as the first member of the Christopher Lab to successfully defend his dissertation. Congratulations to Christian Alcaraz for passing his ATC to become the newest PhD candidate in the group. Congratulations to John Matsubu and Eric Lin on their latest accepted paper, "Critical role of interfacial effects on the reactivity of semiconductor-cocatalyst junctions for photocatalytic oxygen evolution from water". Congratulations to Talin for the acceptance of her paper "Mechanism of CO2 reduction by H2 on Ru(0001) and general selectivity descriptors for late-transition metal catalysts"! Congrats to the Christopher Group for being awarded an NSF CAREER grant entitled "Supports as steric and electronic modifiers of catalysis at single atom metal active sites" from the CBET Catalysis and Biocatalysis program.